Looking for a different place to have lunch or dinner, or simply for a drink? 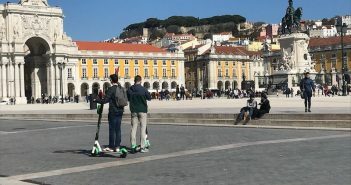 Rooftop restaurants, bars and terraces offer a totally different perspective on Lisbon’s beautiful neighbourhoods and monuments. 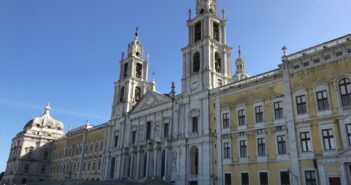 Some offer spectacular views of the River Tejo. 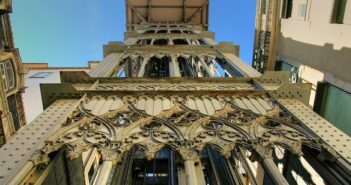 Here’s a selection in central areas of the city to take in the sights and, hopefully, a breeze. Use the map below to locate whichever is closer to you. Fairly close to the castle, Chapitô is a good stop after a visit there. Ask to be seated by the window with fabulous views over the city. If going for dinner, it may be a good idea to book in advance. 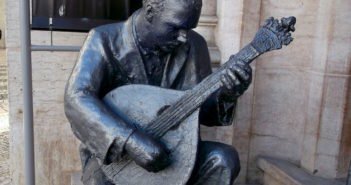 The food is inspired by traditional Portuguese cuisine; they serve a great cod dish. There are two other spaces: a terrace with breathtaking views, especially at sunset, over the city and river, and a bar filled with local artists, students and hipsters, sometimes with live music. The place is owned by a performing arts group, so you may see a juggler or two practicing while you’re there. 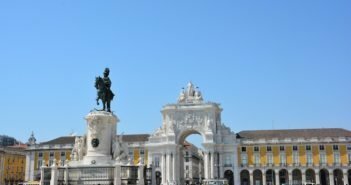 The Baixa and the River Tejo, but also the 25 de Abril suspension bridge and the statue of Christ on the opposite bank. An equally good stop after a visit to the castle, Zambeze combines Portuguese and Mozambican cuisine. 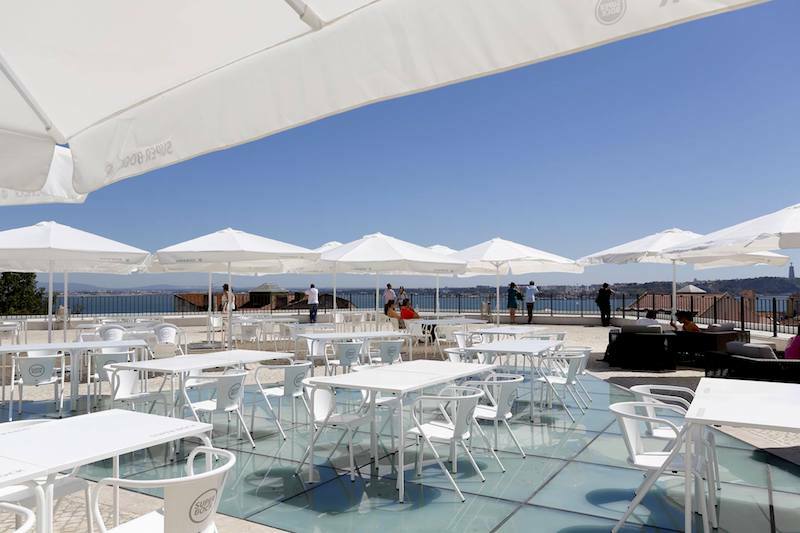 There is an inside eating and a terrace offering a lovely view of the harbour and the River Tejo, day and night. Zambeze claims to deliver a “gastronomic adventure”, but you can just go for a drink at sunset. The harbour, the Baixa area and the river. 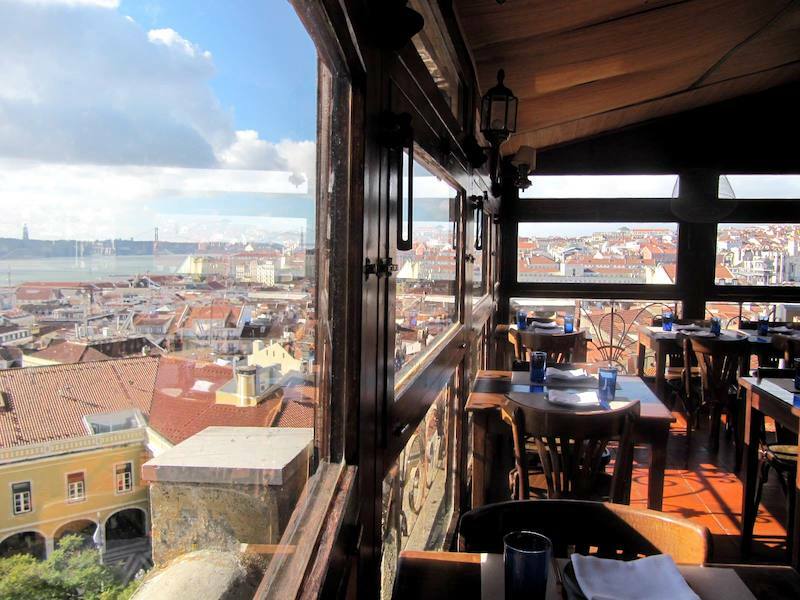 Praised for its flambés, cataplanas and weekly themed menus, Varanda de Lisboa offers a stunning view of central Lisbon. There’s also a rooftop bar and lounge. A a 360º view of the Tejo, the castle and the Baixa district. Bica do Sapato is a modern seafood-oriented restaurant, located in a former industrial area. It has a cafeteria and a restaurant serving traditional Portuguese food with a twist, and a sushi bar. You’d rather come during the day as the river is pitch black at night, no lights out over it, which means no river front view. Altis Avenida Hotel has a rooftop restaurant open daily for breakfast, lunch, a special dinner, or just for a drink or snack. There’s a special lunch menu from Monday to Friday for €15 that includes a main course, water and coffee or tea. 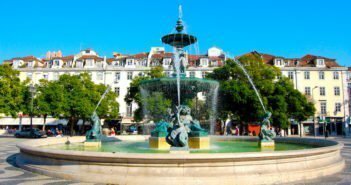 Restauradores and Rossio Square, Avenida da Liberdade and the Baixa area. 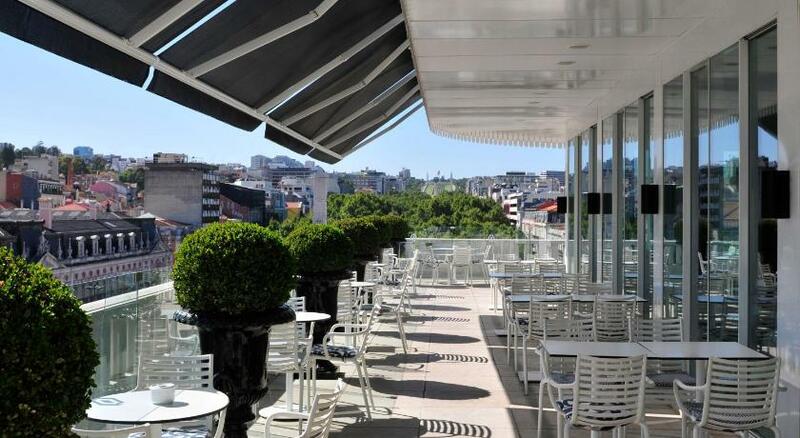 Located in an 18th-century iconic building, the bar at the 5-star Bairro Alto Hotel offers dazzling views over Lisbon’s rooftops down to the river. For cocktails and conversation, you can’t beat the location. The hotel is currently under renovation to be concluded in the last quarter of 2018. Red rooftops, the river, the bridge and the statue of Christ on the opposite bank. Located in Bairro Alto, a few steps from Largo de Camões and next to the Church of Santa Catarina, Park Bar is a rooftop bar over a parking lot, not very easy to find. If you arrive early, you may be able to get a seat and watch the sunset with a sangria or cocktail. They also serve light meals, including soup, burgers and cheese plates. The river, the bridge and the Bairro Alto area. A reference in fine dining, Tágide opened more than 30 years ago. 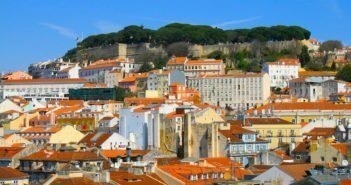 Housed in a building that emerged from the former Convent of São Francisco, destroyed by the great earthquake of 1755, it offers dazzling views of Lisbon. A sumptuous interior features 16th century azulejos (Portuguese tiles) and chandeliers, and 18th century stone fountains. The restaurant upstairs serves Portuguese-based cuisine with international influence. There’s a wine and tapas section downstairs. 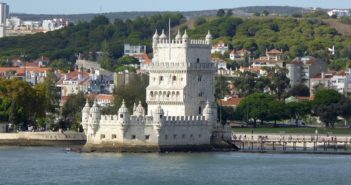 The castle, the Baixa grid, the Sé (Lisbon’s Cathedral) and the River Tejo. 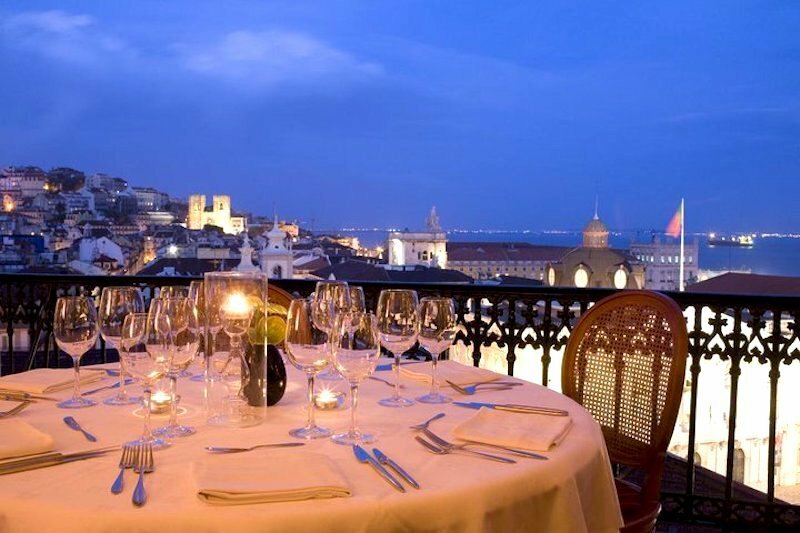 For a romantic dinner, Via Graça is one of the best options in Lisbon. With all tables turned against the huge windows, the view is breathtaking. They serve traditional Portuguese dishes with a twist. The castle, the glowing Basílica da Estrela, the bridge and the statue of Christ across the river. For a brunch on the veranda (spring, summer and early autumn only) or a full-fledged dinner of lobster cataplana, this is the place to treat yourself (it can be a little expensive). The dining room is beautiful, and the service top notch – you’re at the Ritz after all. Parque Eduardo VII, Lisbon’s largest central park, and the city down to the river.